Jane and I drove to Rocky Mountain National Park and arrived around 10:30AM. We parked near the Cub Lake Trailhead, and Jane decided she to go horseback riding, since we were across from the riding stables. She hiked up the road with me and then to the bridge, where Cub Lake Trail crosses the Big Thompson River. I prospected above and below the bridge, while Jane snapped some photos. During this photo opportunity I hooked up with one trout, but it escaped and avoided my net. I was not having much luck, and it was 11:30AM, so Jane and I returned to the car in order to eat our lunch. After lunch I hiked across the meadow from where we parked to intersect with the stream. I planned to fish back upstream to where the trail crossed the bridge. I started fishing a narrow channel with the royal stimulator and landed a few small brookies. I added a beadhead pheasant tail, but that never produced, and I looked up and noticed a husband and wife with a daughter 30 yards upstream. They appeared to be disturbing the water, so I climbed out and headed farther south. 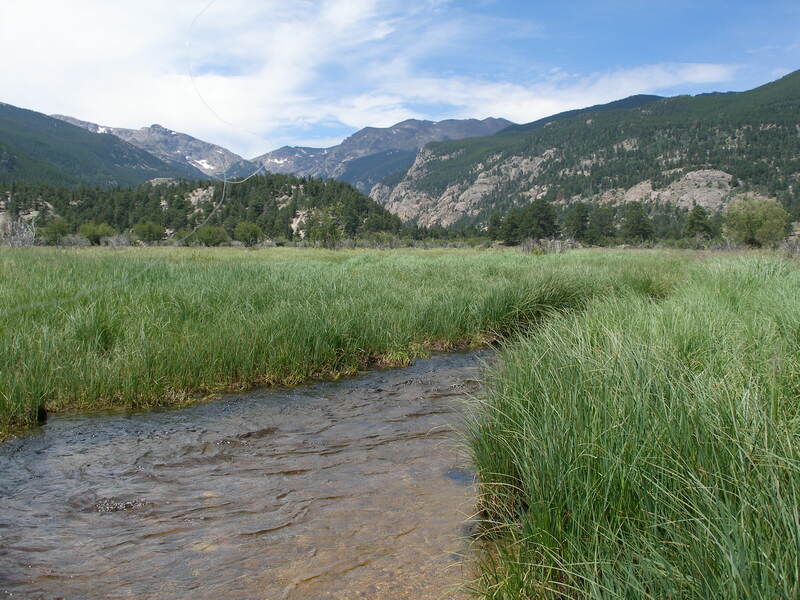 I was skeptical that the small stream next to me was the full volume of the Big Thompson River, and sure enough I discovered another larger channel after a short stroll through the meadow grass. 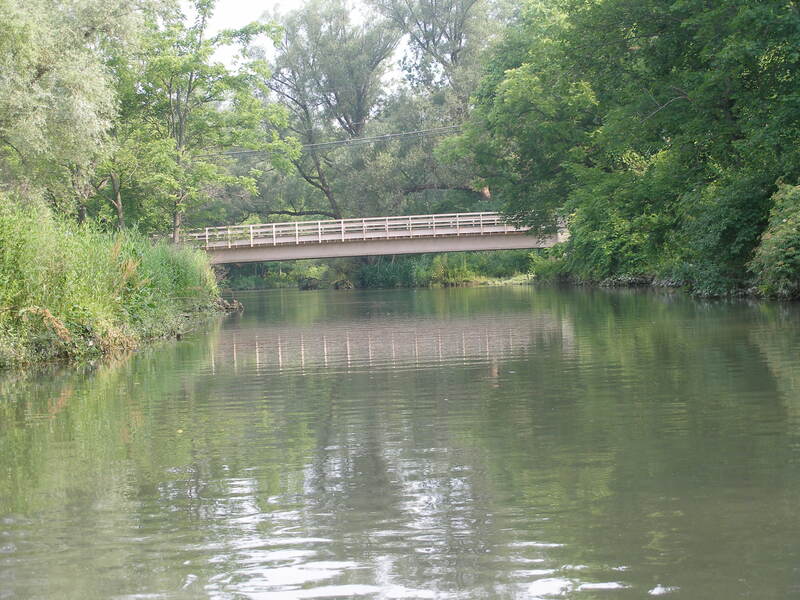 Once I intersected with the main stem, I walked downstream farther, before I started fishing upstream. I caught mostly brook trout, some extremely small, and I omitted them from my landed count. I spotted a decent fish at one point, but it was not interested in the fly I presented, so I switched to a light yellow Letort hopper, since hopper habitat in the form of tall grass bordered the stream. I never tempted the fish that caused me to switch, but the hopper did produce a rainbow of around 11 inches. I prospected the hopper and beadhead hares ear dropper for awhile and landed some brook trout but eventually lost the flies. After losing the two flies I tied on a lime green trude size 14, and this produced a fair number of trout. I caught my nicest brook trout of the day on the lime green trude and photographed it before I released it to live another day. At some point I spotted another decent trout, and I was unable to tempt it with the lime green trude, so I knotted on a size 12 gray parahopper with a beadhead hares ear trailer. The parahopper produced a nice brown, and I photographed the third leg of the grand slam. I ended up catching 3 browns on the day. I tested the parahopper for awhile, and then I switched back to the royal stimulator. The royal stimulator was probably the most productive fly of the day, and I landed the last eight countable size fish on it. I also caught my one and only cutthroat trout on this fly towards the end of the day. I was quite surprised to achieve a trout grand slam. I ended my day at the Cub Lake Trail bridge and hiked back down the road, where Jane was waiting in the shade and reading. After having a great day on the Eagle River on Saturday, Jane and I agreed to go to Rocky Mountain National Park for the day on Sunday. Jane invited her friend, also Jane, to join us. We left the house around 8:30AM and decided to go to the Wild Basin entrance in the southeast corner of the park. 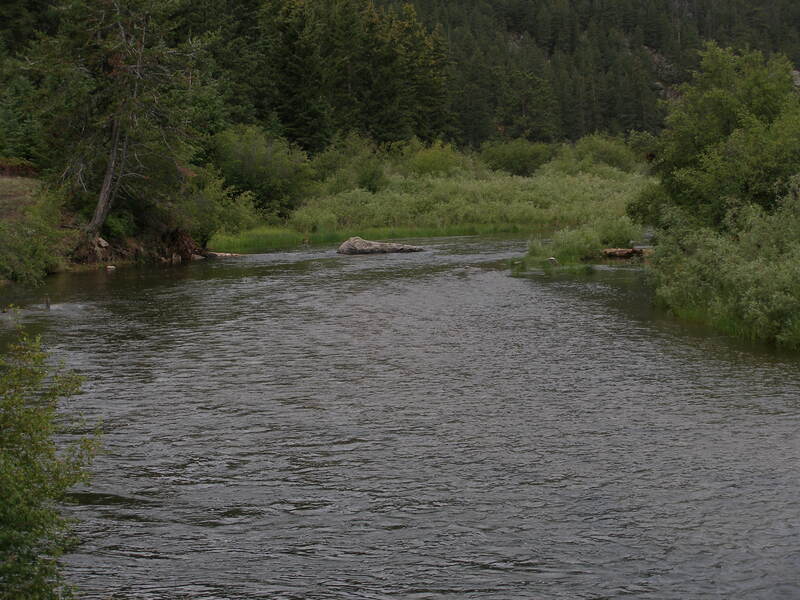 This is where I fished on the Fourth of July with great success. The girls laced up their hiking boots and took off on the Ouzel Lake trail. I geared up and walked down the dirt road a decent distance. The stream level dropped considerably since the Fourth but was still flowing strong bank to bank. 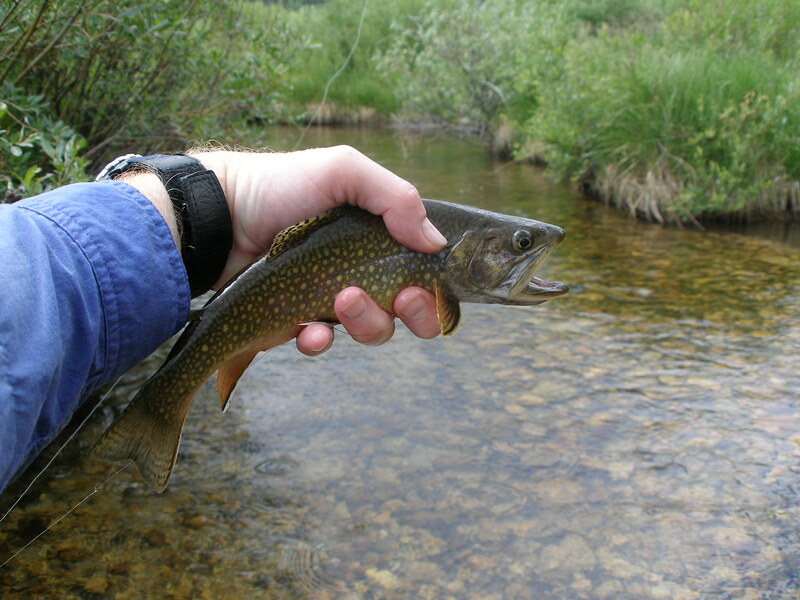 I tied on a green trude, and fairly quickly I landed a beautiful brook trout. I continued to catch fish, but not in the expected places. 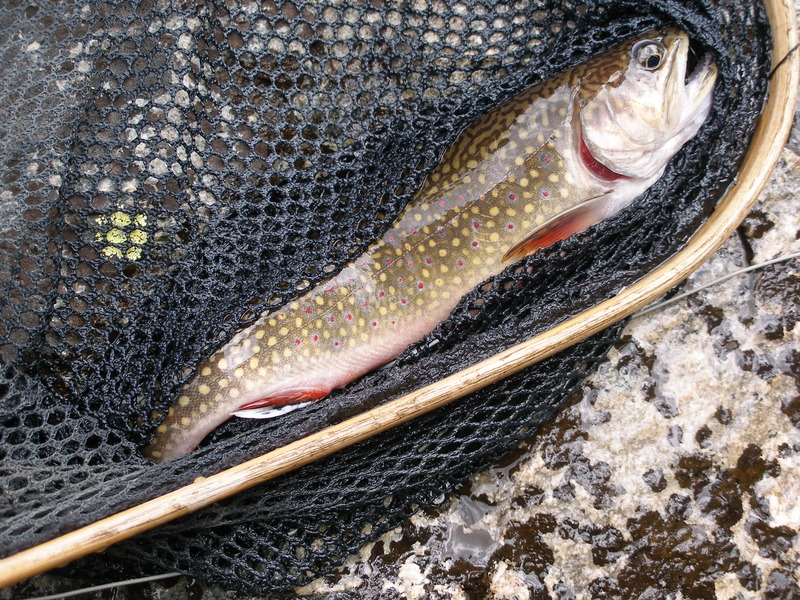 When another brookie came to my net, I thought it was going to be a brook trout day. By the end of the day I caught perhaps 5 or 6 brook trout, and they were in the 7-8 inch range, but they were very colorful. I did not think the green trude was producing that well, so I converted to the royal stimulator that worked late afternoon on the Eagle. It is very buoyant and visible due to the swept back white calf tail wing. I picked up a few after the switch to the stimulator, but in a very nice run, refusals predominated, so I added a beadhead pheasant tail dropper, and the refusals morphed to takes. 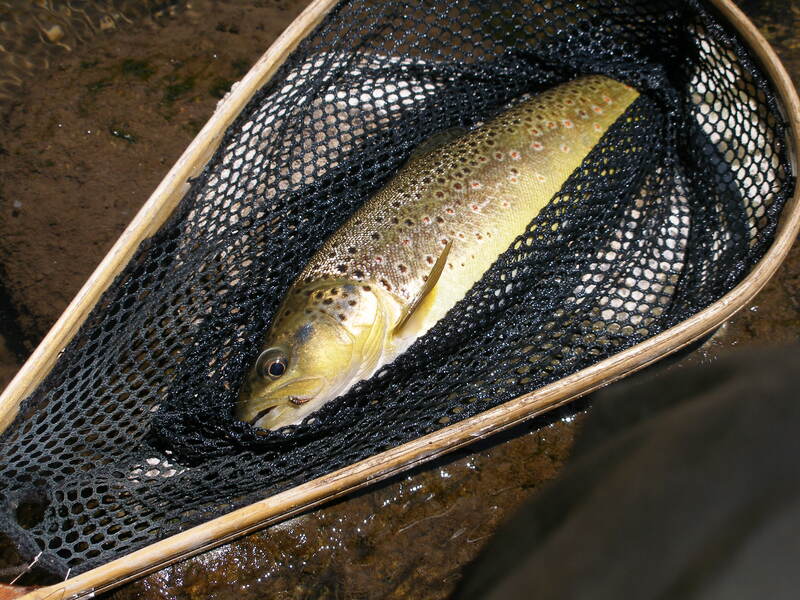 With the addition of the pheasant tail I began to catch predominantly brown trout. Many were in the 6-10 inch range with the occasional 11-12 inch fish, but it was great fun popping the stimulator in all the likely lies and pockets. The stream width enabled me to cover the entire area from either left, right or center position. At around 12:30 I returned to the car for lunch. I decided to remove the backpack and just fish with the front pack to lighten the load, and I returned to the stretch where I ended before lunch. At this point the stream spread out some, whereas before lunch I moved through a section where the stream narrowed and the gradient increased. The high gradient produced deep plunge pools, but they were not yielding fish. Unlike the Fourth of July, the fish spread out from the banks, but this was only the case in areas where the gradient was more gradual, and the stream bed widened. In the first hour after lunch, I caught trout with regularity on the royal stimulator. In fact, the pheasant tail dropper became a nuisance, so I removed it and fished with only the attractor. Unfortunately after about an hour of fishing, and 20 trout landed, the hackle unraveled, and this was the only royal stimulator in my possession. I switched to a green trude again, but the hackle on this fly also broke after a few fish. I decided to return to the car to my backpack and obtain more attractor dries. When I returned to the creek, I fished a small size 14 lime green trude. This produced quite a few fish, although I also noticed quite a few green drake mayflies fluttering about. This was at 2:30PM, and I approached a beautiful deep pool with a large rock on the left bank. I experienced a refusal on the green trude from two fish, so I switched to a green drake cripple, and I drifted this large fly over the trout that I could see in the center of the pool. The visible trout indicated that it saw the drake cripple; when it rose, inspected, and then drifted downstream under it. I held my breath, and finally the cautious trout rose and slurped the cripple. What a fun scenario. I continued fishing the green drake cripple and caught three or more fish, but eventually I lost it on a branch on a back cast. I looked in my front pack and spotted a gray humpy, that I placed there upon my return to the car. I tied on the humpy and landed another four or five. Eventually I reached the bridge where the road crossed the stream just before the Wild Basin parking area. By this time I landed approximately 40 trout. 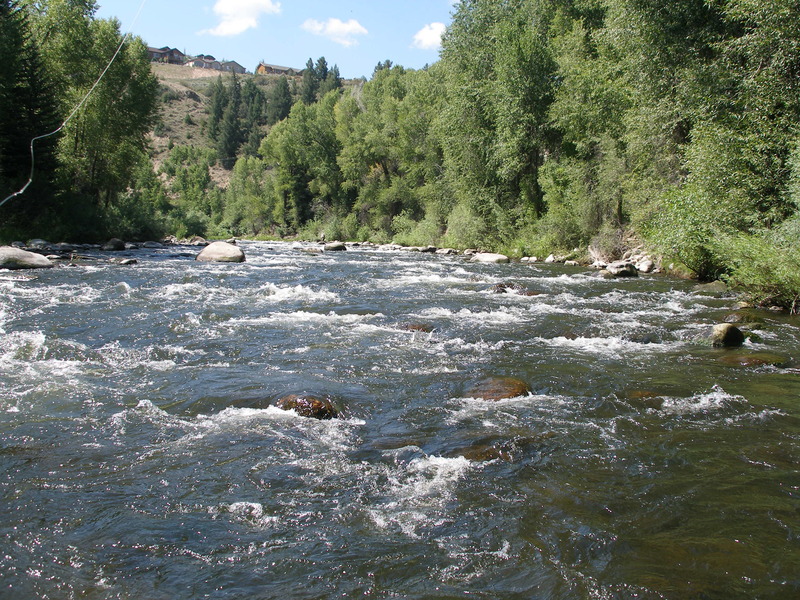 The largest fish was only 12 inches, but it was great fun, as I popped attractors in all the likely lies, stood in an ice-cold mountain stream, and enjoyed the beauty of the Rocky Mountains. I even sat down on a rock several times and drank from my water bottle, while I took it all in. 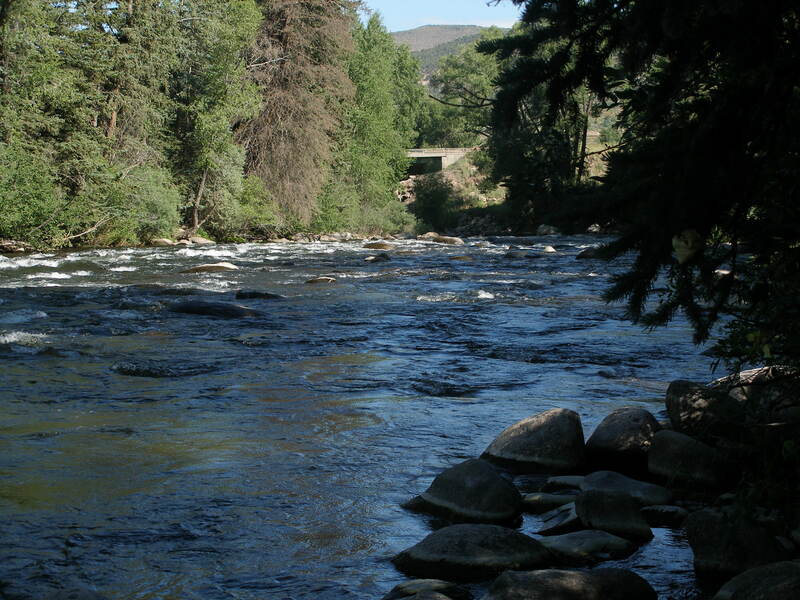 Having recovered somewhat from a nasty cold and with a weekend free to fish, I decided to return to the Eagle River, where I had great success on July 12. I parked at the rest area and hiked the bike path on the north side of the river to the pedestrian bridge, and then I crossed to the south side and began fishing along the right bank. Most of my fishing during the entire day was within ten feet of the bank. The flows were around 300 cfs, 200 less than July 12 but still fairly stiff, and the fish continued holding tight to the bank. I decided to use a gray body parahopper on top with beadhead pheasant tail nymph trailing. The beadhead peasant tail produced exceptionally well in the afternoon during my earlier visit. In short order I landed a fat thirteen inch brown on the trailing pheasant tail. I noticed another fisherman above me on the right side, but he was close to the bend along route 6 and probably 100 yards or so upstream. I estimated that I could work along the bank until lunch and not reach him, and this assumption proved correct. I cast the parahopper/beadhead pheasant tail combination in all the likely runs and pockets. 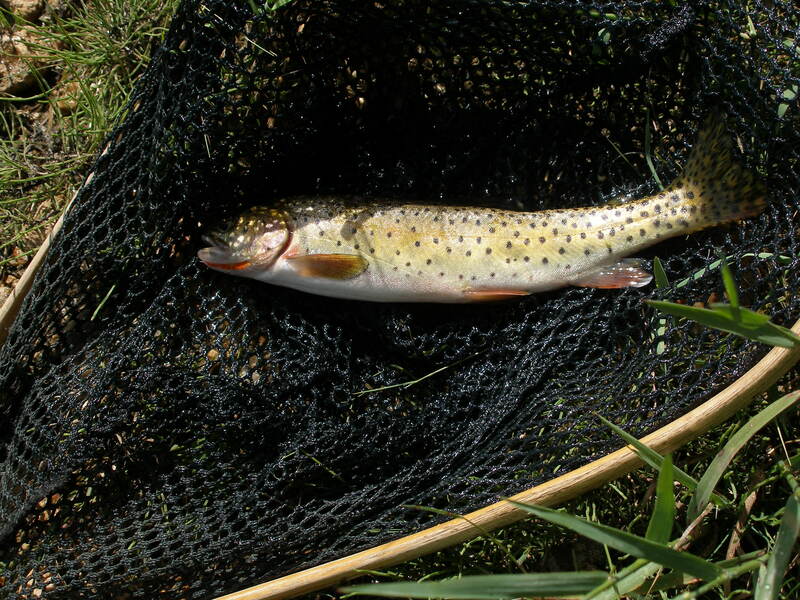 I landed six additional brown trout, before I retreated to the car for lunch. Four of the seven fish that I caught in the AM were quite nice, as three of the seven inhaled the parahopper, and the rest preferred the nymph. After lunch I decided to circle around the other fisherman, so I crossed the main bridge and then followed the bike trail up to the pedestrian bridge, where I made a right and skirted the apartments and turned left on route six. I ended upstream from the other fisherman and crossed the river to position myself to fish the smaller left channel around a small island, but when I turned to survey the channel, I saw two other fishermen already there! As a fallback I decided to fish along the south side of the small island in the right channel. At the point of the island in some very shallow water where the river deflected to the right, I landed a beautiful brown, that took the beadhead pheasant tail almost immediately after it hit the water. I was now above the two fishermen I saw previously, so I covered the north bank for the remainder of the afternoon and caught another ten trout. Quite a few were very nice 14-15 inch fish, and many were feisty and in the 12-13 inch range. At one point in mid-afternoon I endured a refusal on the parahopper, so I clipped the combo off and tied on a tan body deer hair caddis. 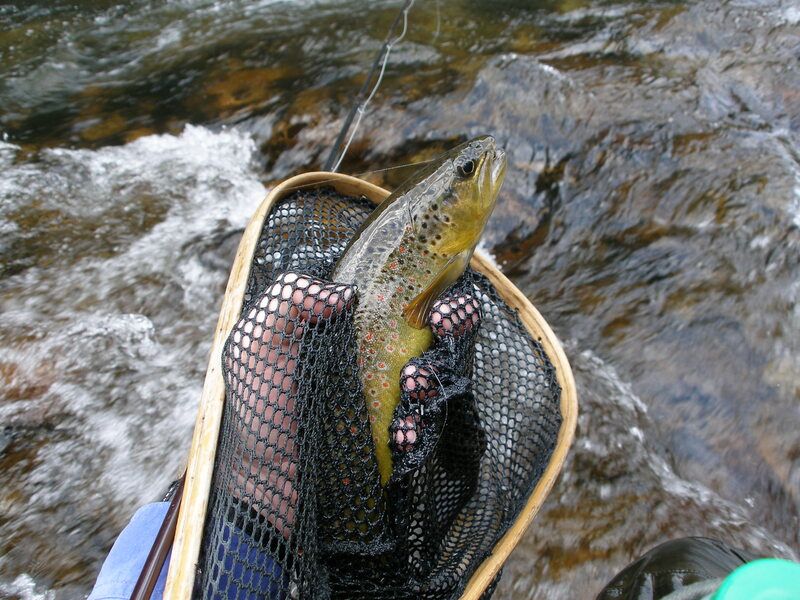 On the first cast with the caddis the same fish that refused the hopper slurped down the new offering. On another occasion the same thing happened, and I once again switched to the caddis, and I landed two fine trout in short order. In late afternoon the parahopper stopped producing, so I tied on a royal stimulator that produced on my first trip to the Eagle River. I landed two trout on this fly, and in the last 1.5 hour I hooked up on some very nice fish, but failed to land (long distance release) them. One wrapped my flies around a rock, and the others slipped free of the hook. At the last minute I decided to use a vacation day in the midst of budget preparation at work to make a trip to the Eagle River. I committed to driving to Santa Fe over the weekend and was, therefore, locked out of fishing during that time frame. I read that flows dropped to 514 cfs. 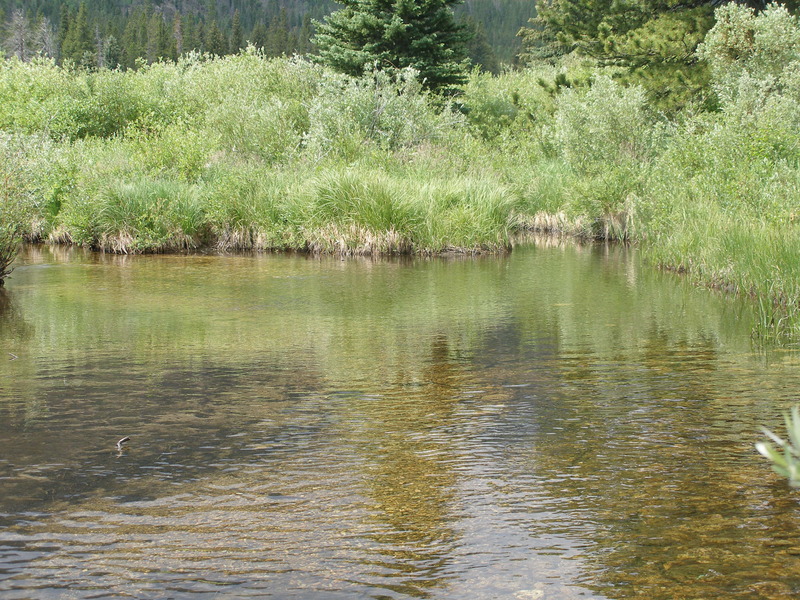 From historical experience I knew that when flows drop after snow melt, the Eagle can be a hot fishery. I arrived at the Edwards rest area around 9:45AM, and by the time I put on my waders and strung my line, it was 10AM. I walked across the road and worked my way along the north shoreline for quite a distance, before I started. I tied on a light yellow Letort hopper with a beadhead pheasant tail dropper. I was not seeing much action, so I switched out the dropper for a bright green beadhead caddis pupa. Still no takes resulted, and I noticed quite few small caddis flitting about, so I changed to a smaller beadhead emerald caddis pupa. This worked, and I caught a nice brown on the emerald caddis and then two beautiful brown trout on the hopper. 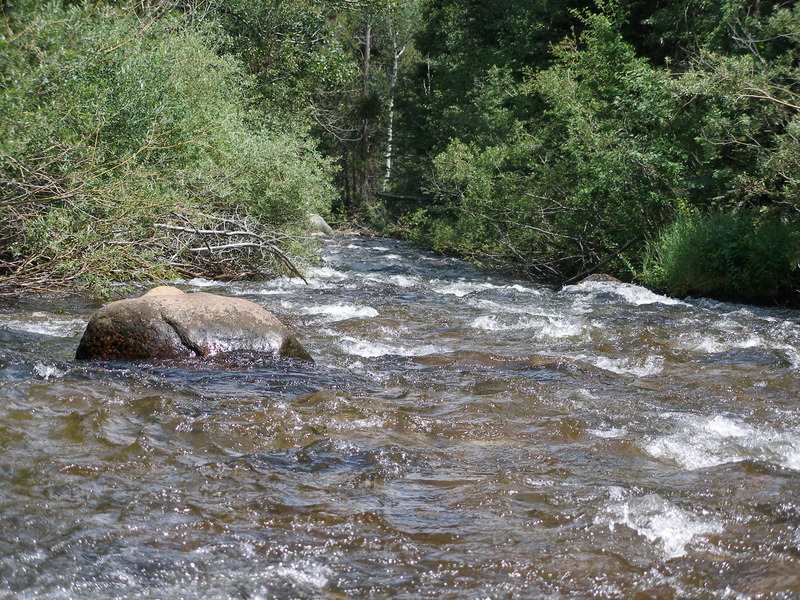 The flows were strong but clear, and the fish were hugging submerged rocks at the tails of pockets and slots. I caught one more brown before lunch on the caddis pupa. All the browns were in the 13-16 inch range, and this would prove to be the case for the remainder of the day except for four or five in the ten to twelve inch range. After lunch I hiked back down to the bridge and began fishing upstream from there along the north bank. My fishing was confined to the ten feet of water next to the bank except for a stretch directly across from the rest area parking area, where the river widened, and the flow dispersed over a broader area. 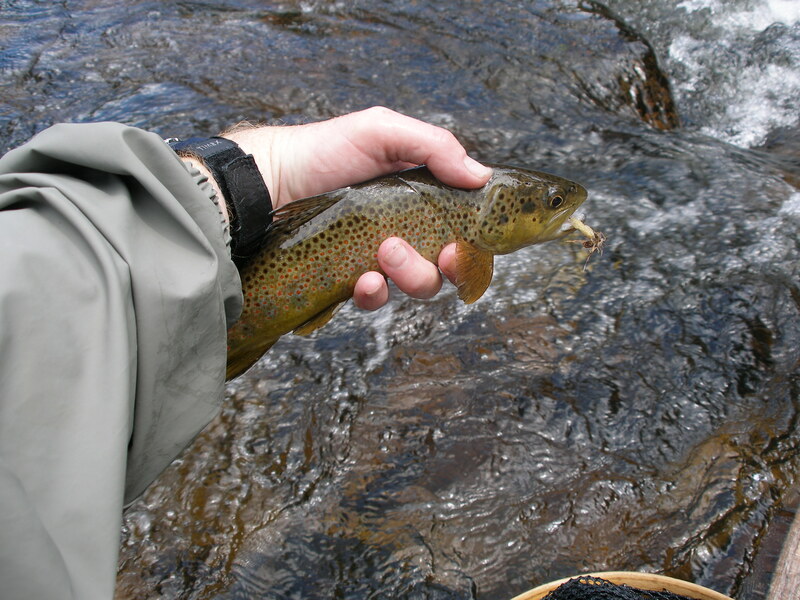 I picked up another four trout tight to the bank upstream from the bridge on the emerald caddis after lunch. When I reached an area above where a small side brook entered, I experienced a refusal at the tail of the run on the hopper. I moved farther out in the current to cover some mid-stream pockets; and when I was above the run where I witnessed the refusal, I saw the fish rise to a natural. 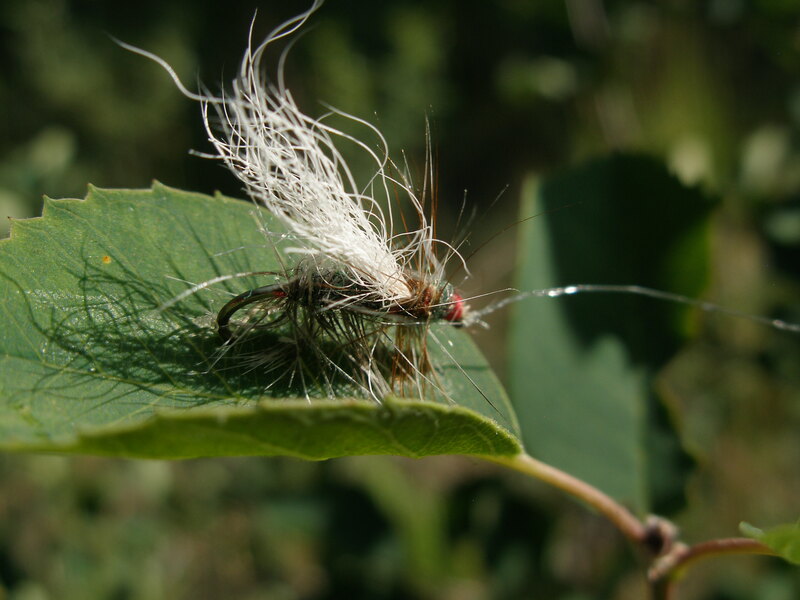 There were small mayflies emerging at this point in time, so I tied on a parachute pale morning dun. The fish gave this fly a look but did not eat it, so I next tried a CDC olive. On about the fourth drift the fish rose and inhaled the olive, and this success was very rewarding. Next I began spotting green drakes, as they took flight quite sporadically. A western green drake is a large lumbering mayfly on the water that does not typically go unnoticed by trout. I knotted a green drake cripple to my leader and worked the water thoroughly for an hour with this imitation. This change in approach yielded two smaller browns close to shore. I did no see many mayflies emerging after 3PM, so I tied on a large attractor fly that I made from the Scott Sanchez book (peacock and red floss body with white calftail wing) and a beadhead pheasant tail dropper. I was now above the long pool with a nice run entering upstream of the rest area. 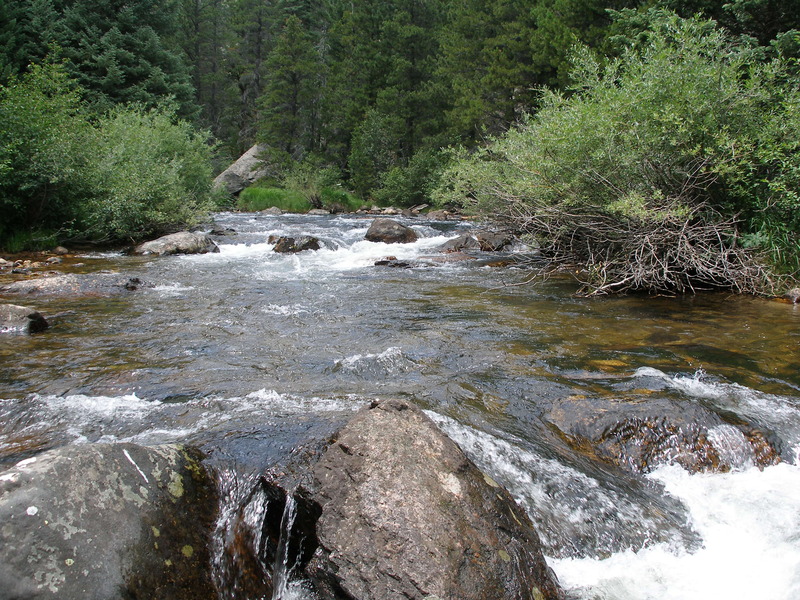 The area above the long pool is characterized by thirty yards of pocket water. The Sanchez convertible combined with the pheasant tail proved to be very effective. I landed four or five very nice browns, as most consumed the beadhead pheasant tail, but one or two crushed the large attractor. After landing the four or five fish, I connected with perhaps the largest brown of the day. I know this, because it jumped out of the water and broke off both flies. I did not have any more of the large attractors in my front pack, and did not want to pause to search my backpack, so I tied on a royal stimulator fly with a peacock and red body. I added the beadhead pheasant tail dropper and landed another four trout. Two chomped the nymph and two smacked the royal stimulator. All the fish caught in the pocket stretch after 3PM were beautiful specimens in the fourteen to seventeen inch range. Dave Gaboury and I fished all day on the South Platte River in Eleven Mile Canyon in spite of heavy rains and flooding across Colorado during the previous two days. In fact, it rained off and on all day while we fished, and the precipitation was quite heavy at times. Despite these conditions the water was essentially clear most of the day, because the South Platte River is a tailwater from Eleven Mile dam in the area where we fly fished. I managed to catch six small trout, and roughly half were rainbows and the other half browns, and they were caught on a hopper/dropper rig. 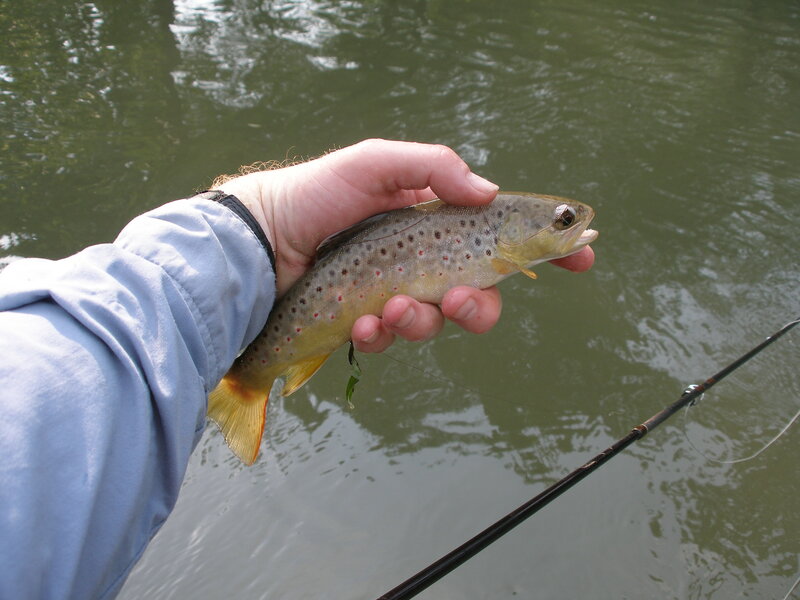 At two times during the day, I fished at length to clusters of trout feeding on hatching mayflies. During the morning I spotted a pod of six trout rising regularly in a mid-stream pocket behind rocks. I suspected they were taking tricos, so I returned to the car and obtained my trico spinners, but I was unable to tempt any of the trout except for a very small rainbow. During the afternoon after a short downpour which clouded up the water for a bit, I spotted three or four fish rising in a slack area along the far bank. I believe they were rising to BWO’s, but I was unable to connect with any of the visible fish. After reading all the fishing reports, I noted that Rocky Mountain National Park water levels dropped, and reports suggested that it was fishing well, so Jane and I decided to spend the day in the park. 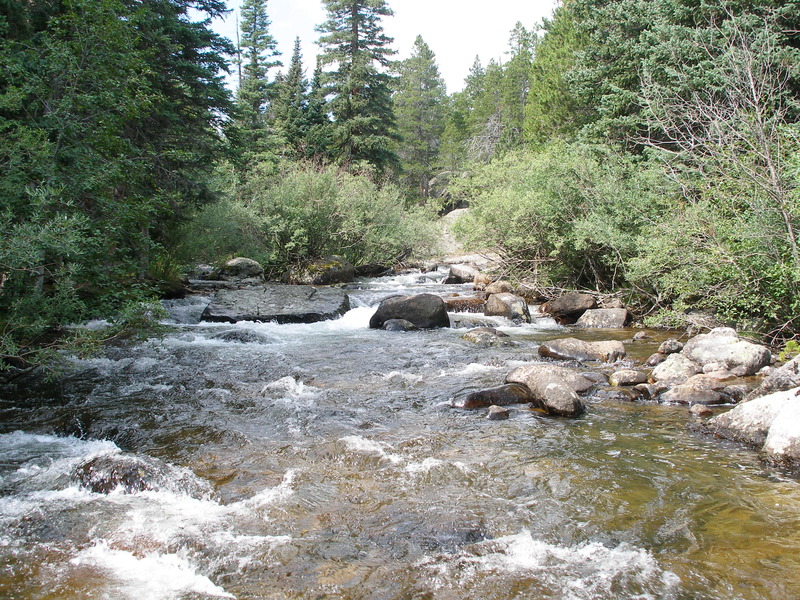 I chose the southern Wild Basin area, as that contains the North Fork of the St. Vrain River. The park entrance person told us the parking was full at Wild Basin, so we parked at Winter Parking lot around .5 miles from the entrance gate. I never fished the lower water below Wild Basin parking, so I was fine with this option. 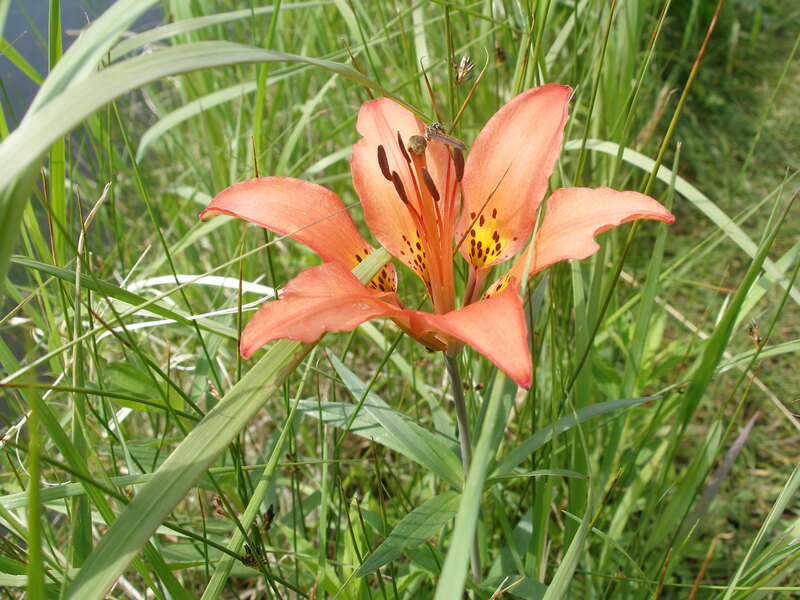 Jane decided to hike the Finch Lake trail, and that was another .5 mile up the road. I hit the water around 10:45AM in a stretch full of channels and beaver ponds. 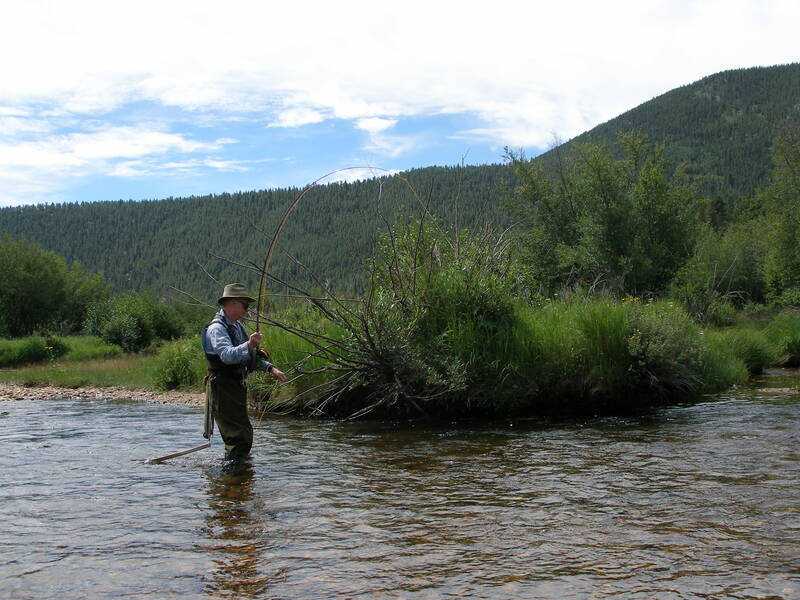 I tied on an emerald trude and began casting in fairly shallow smooth water. Almost immediately I landed a small brook trout. I kept moving upstream a foot or two farther at a time and landed another three brookies. 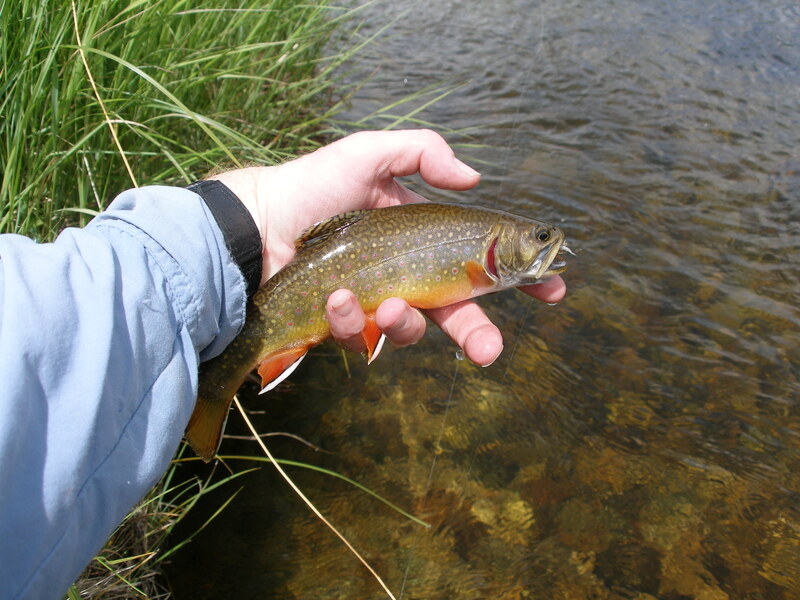 The last two were in the 9-10 inch range, and that represents a very reasonable size for Colorado brook trout. But the sky darkened, and a few raindrops fell, so I decided to exit and return to the car for my raincoat, before heavy rain commenced. When I reached the car, I was in the process of removing my vest and belt, when the rain really intensified, so I decided to eat my lunch in the car and wait out the storm. It was now 11:30. After lunch I put on my raincoat and returned to the beaver pond area, where I ended my earlier session. 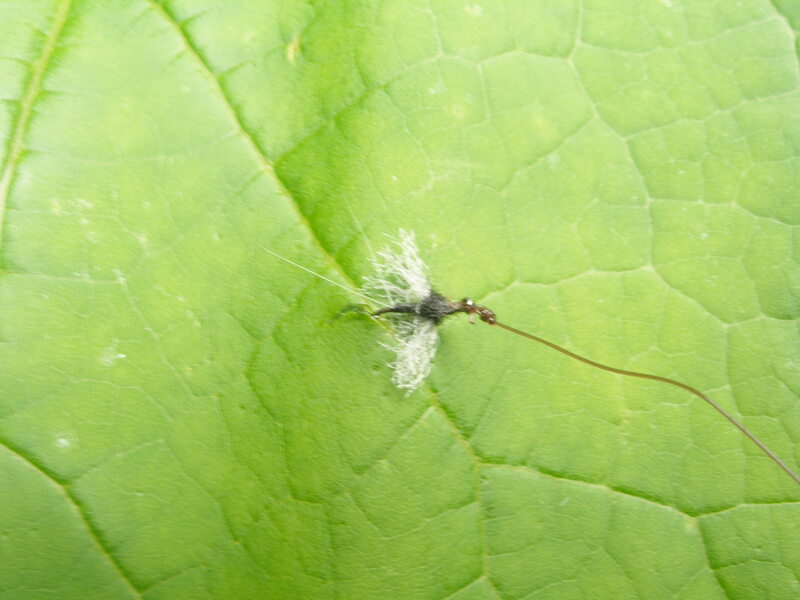 Another cloudburst developed, and the trude began sinking repeatedly, so I tied on a yellow Letort hopper and beadhead hares ear nymph. I caught a couple browns on the nymphs, but I was progressing deeper in the maze of ponds and channels, and fear of getting lost entered my thoughts. Also I really desired faster moving water. I exited and hiked along the stream looking for normal moving water, and I found it at a bridge, where the dirt road crossed over. Here I began fishing upstream. The creek was flowing rather high but clear, and I discovered that all the fish were in slack water lies tight to the bank. I switched to a beadhead prince dropper at some point, with the thought that it would be more visible to the resident trout population. I worked upstream covering a lot of water seeking the slack water lies along the banks, and this approach enabled me to pick up fish here and there. I lost several pairs of flies along the way and ended up utilizing prince nymphs, a chartreuse copper john, and a double bead caddis larva. For the most part, the fish were attacking the yellow Letort hopper. I lost the bright yellow version and switched over to a pale yellow model, but the fish did not seem to mind. At one location near some picnic tables next to the stream in a nice pocket, I saw a fish rise but turn away. At this point I had the chartreuse copper john as a dropper. The fish appeared to be larger than others, and after a couple more casts I hooked up with a nice size brown. 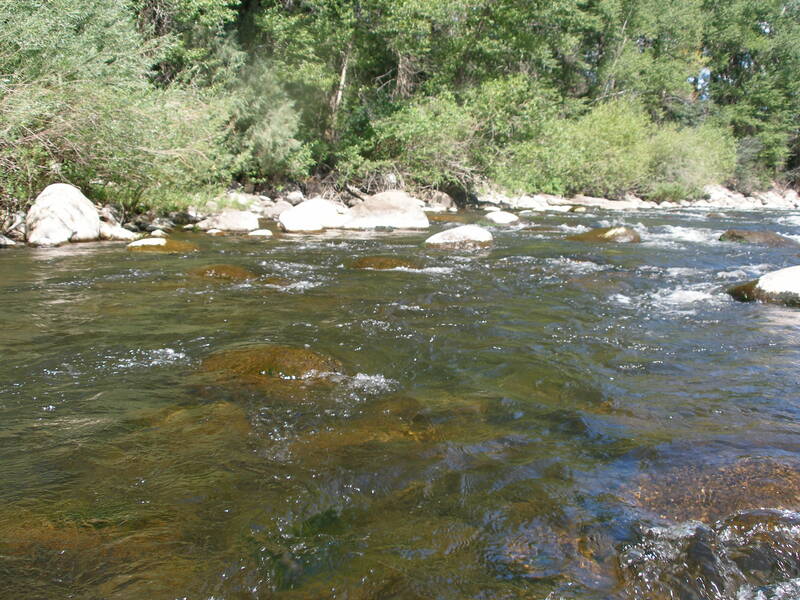 The fish immediately charged out of the pocket and headed downstream into some heavy white water. I let the fish run in the fast current, but after around twenty feet I applied pressure. I managed to elevate the fish to plane on the surface two or three times, but could not maneuver it to a position near me, and there was no way to follow it downstream due to tight evergreen vegetation and heavy current that bordered the bank. Eventually the fish parted the line, and once again my line was devoid of flies. 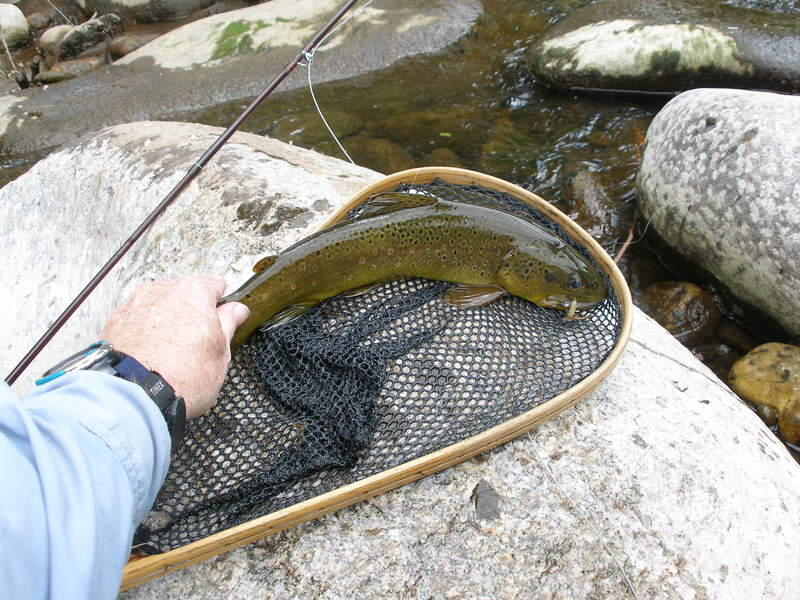 I landed seventeen trout before I quit, and I returned to the car at 3:15PM. Of the eleven trout caught after the beaver pond area, all but two or three rose to the hopper pattern. 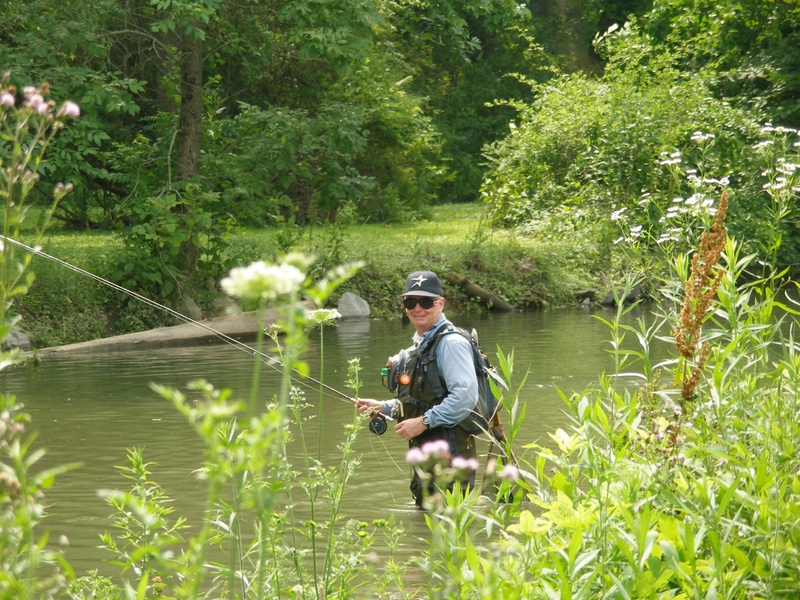 Jeff Shafer called to tell me the Monocacy was clear and fishable, although somewhat high for this time of year. 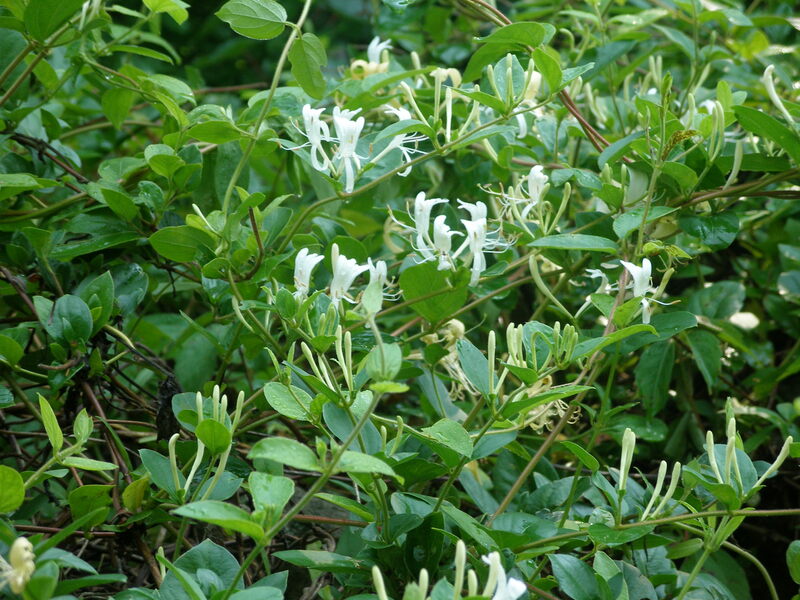 He mentioned that tricos were hatching, and I met him at the bridge on Bridal Path Road a little after 8AM. We began fishing a long smooth pool below the bridge. 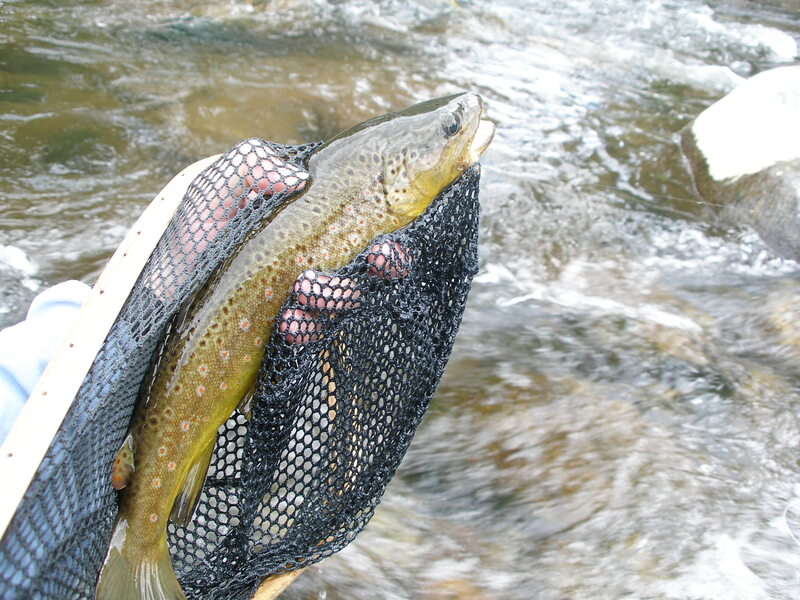 Numerous trout were rising along both banks along with several in the middle of the stream. I tied on a poly wing trico spinner, but I was not generating any interest. Jeff switched to a parachute dun and began to connect. He offered me a similar fly, and I accepted and managed two browns. The size of the trout was generally eleven to twelve inches. As time went by, the dun no longer produced, so I tied the spinner back on and met with success. I caught one brown on the black bodied spinner and moved above the bridge with Jeff. 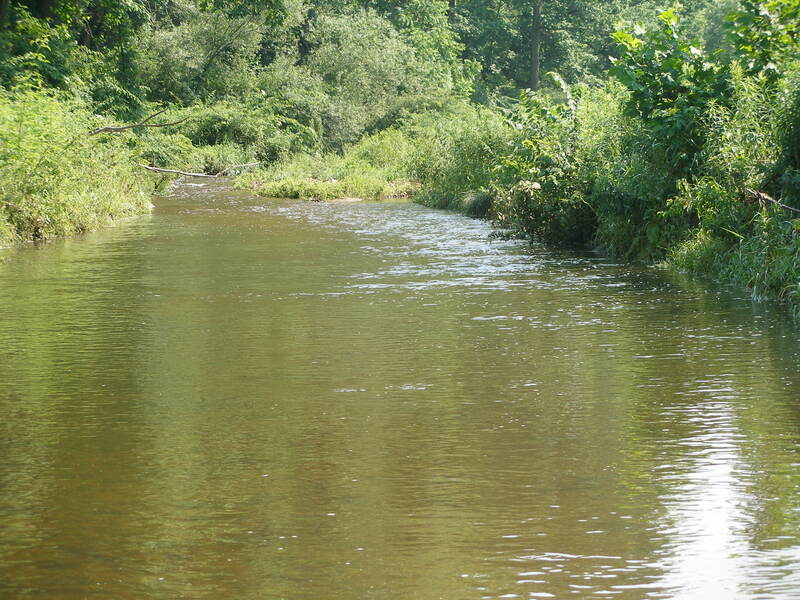 Several fish were rising on the far side of the run below where two channels merged. 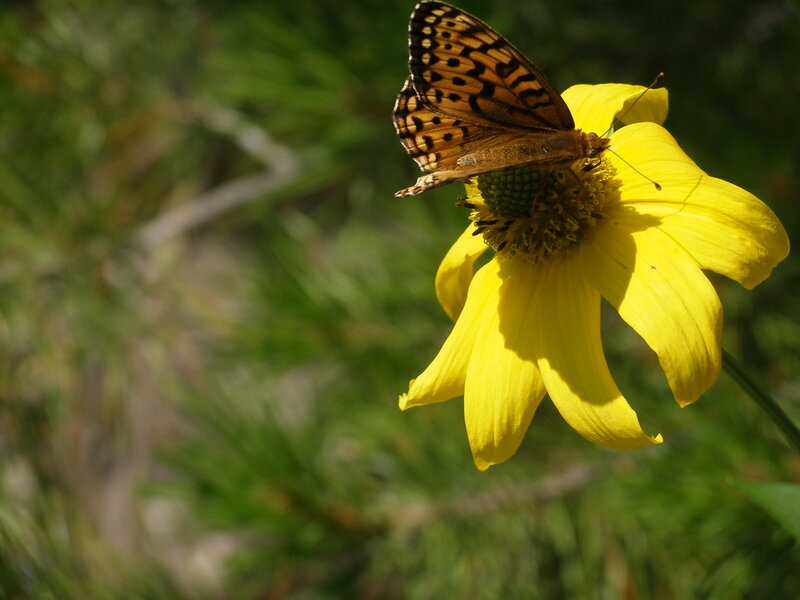 I caught two browns here, as I persevered with the spinner, as Jeff switched to a beetle. The hatch now thinned significantly, and I was not seeing rises. I switched to a yellow Letort hopper trailing a beadhead hares ear and almost immediately caught a small brown on the beadhead hares ear nymph. Jeff commenced fishing up the right channel which was smooth, while I chose the left channel, since it provided nice runs and riffles. I worked the dry/dropper combination up the left channel, but success evaded me. I crossed over to the other side, and Jeff was not experiencing luck either, so we headed back to the flat water below the bridge and searched for subtle bank risers. I switched over to one of Jeff’s beetle imitations and cast to an indentation on the far bank, where Jeff spotted a rise. A fish sipped the beetle, and I had a momentary hook up, but alas the fish escaped. The weight of this fish felt greater than others I caught. I spotted a rise directly downstream from me five feet out from a dead tree trunk. I cast the beetle directly downstream and fed out line. When it reached the point of the observed rise, a brown sipped in the beetle, and I coaxed it into my net. Not seeing anymore fish revealing their whereabouts, I walked downstream below the cement dam and switched over to a hopper and beadhead hares ear. 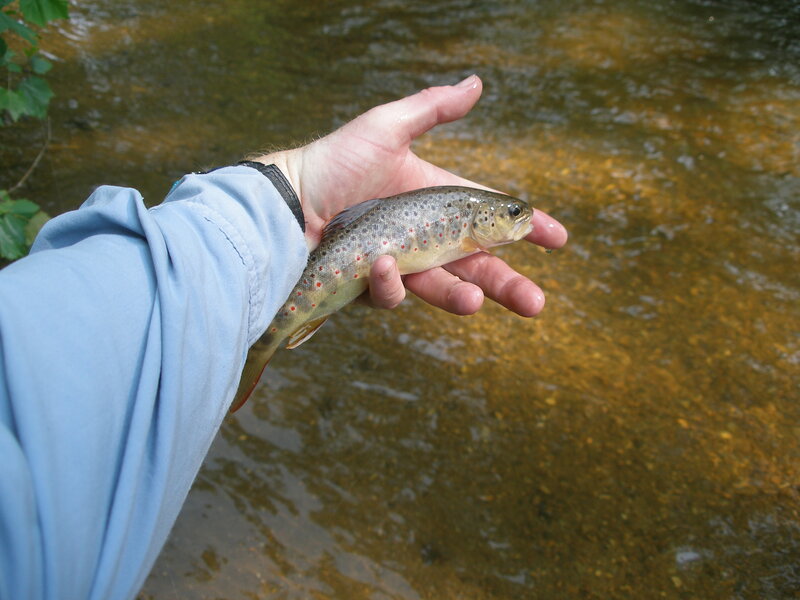 In the riffles below the dam, I caught a small brown. Jeff and I tried to catch a rising trout that was tight to some debris jutting out from the bank, but neither of us could succeed. 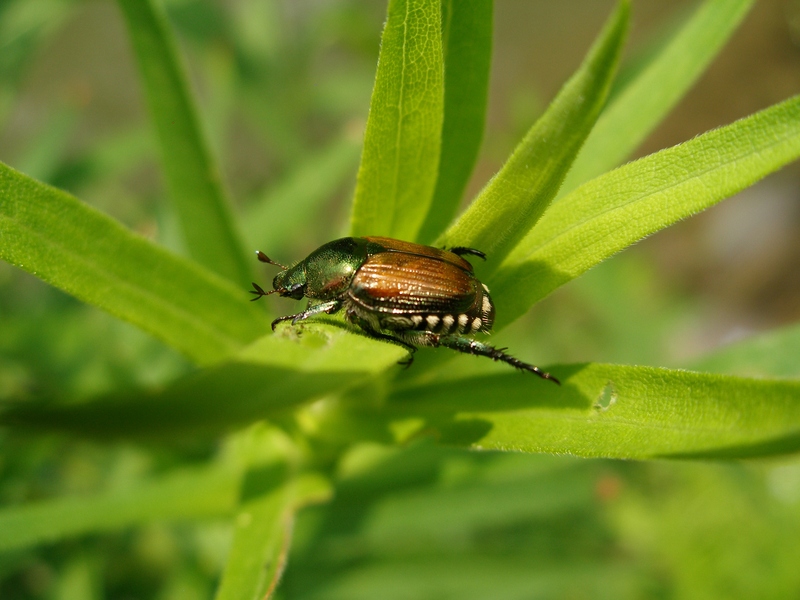 We began photographing Japanese beetles, as they were thick on many of the bank side weeds near us. Jeff showed me how to use the spot setting on the camera to allow auto focus on super macro photos. I returned to the Perkiomen Creek on Saturday morning before the Bear Reunion event. I decided to try another stretch farther upstream, where an old hotel is next to the creek. The hotel was converted into apartments. I parked at a pullout just after turning off of Forgedale Road, and I entered the water, before I went under the bridge. I fished the same yellow Letort hopper and beadhead hares ear combination that served me well on 6/30/2006. 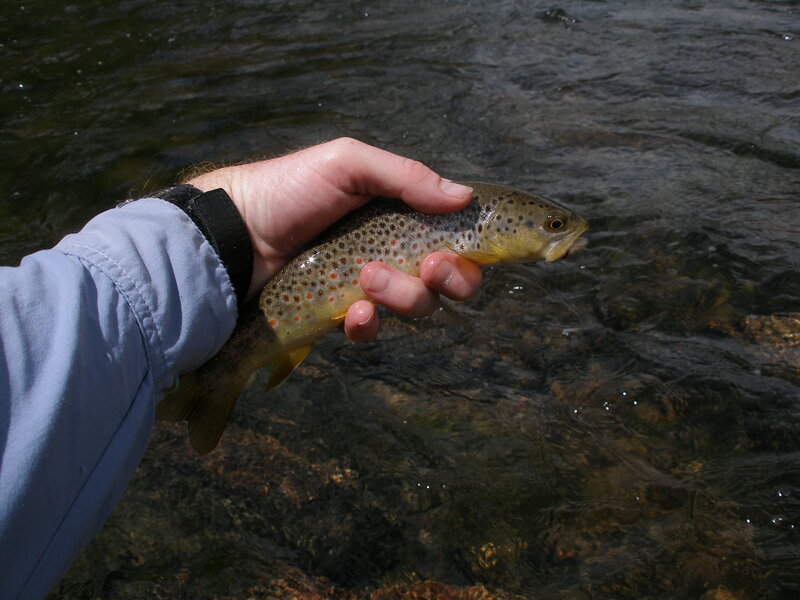 I prospected all the likely locations, and I landed nine small browns. They were all smaller than most of the fish I caught the day before. I was surprised that this stretch did not fish better, as it was more remote and required more of a commitment. I ended my morning at a long straight run within an area that was cleared for a natural gas pipeline. A beautiful bend pool just before this stretch surprisingly failed to generate a look. In the long run, I hooked a fish on the hopper that felt heavier than most, but I broke off the flies on the hook set. Most of the small browns took the beadhead hares ear.